Your Goal Should Normally Be to Win Playing the Style You Are Developing. Let's go in order here! Every major sport has a Hall of Fame where fans can read about their favorite stars and learn about others. The USA Table Tennis Hall of Fame was created in 1979 - after a "false start" in 1966 (read about this in the History of the Hall of Fame). Steve Isaacson was the primary mover in its creation. The Hall honors the greatest table tennis players, officials, and contributors since USATT (then USTTA) was formed in 1933. Wow . . . the sheer amount of stuff that's gone on this week is beyond mindboggling. Here's a rundown. Power Outage. Remember the planned power outage I wrote about that was supposed to happen on Wednesday, 7AM - 5PM? Rather than lose a day, I was up at 6AM, packed the computer, monitor, printer/scanner, and lots of other supplies, and Tim and I left to go to the club (MDTTC) to work in the back room there. I got everything set up there by 8AM, and we were set to go to work. Then we received an email at 8:07AM that due to freezing temperatures - 32 even - they were postponing the outage. (Don't they read weather reports?) So I packed everything up again and went back home. Roughly speaking, from 6:30-9:30AM all we did was pack up things, move them, and set them up again. One worrisome item - while setting up at the club, I plugged in a power cord, and then tossed the cord under a table so I could connect it to the computer. As I tossed it, I felt a sharp pang in my shoulder. Hopefully I didn't hurt it much. I have to be very careful with that arm. Power will be out in my house on Wednesday for outside electrical repairs (7AM-5PM), so Tim and I need to finish Volume 21 of his History of U.S. Table Tennis today. Translation: I worked practically all night Monday night, and we'll be working all day and late into the night on Tuesday to finalize everything. So no time for the blog. I'll be back on Thursday. Meanwhile, here are Strange Ping-Pong Tables and Other TT Stuff! "Hot Anger" versus "Cold Anger." In the Saturday Junior League & Camp (two hours, about 25 players), the focus was on serve and attack, and handling your opponent's attack. We had them play games where the server had to serve and attack (or counter-attack if the receiver attacked the serve), or he instantly lost the point. However, the receiver, if he won the point after the server attacked, won two points. It made things interesting! In the Sunday Beginning Class (90 minutes, 15 players) - week nine out of ten this session - the focus was on serves, smashing, and smashing lobs. I was impressed with some of the kids who are really learning to spin their serves. Two kids were practicing serves on the same table, with one serving forehand pendulum serves from the backhand side, the other serving backhand serves from the forehand side, and since they often timed it so they served at the same time, it was interesting to watch their respective serves spin away from each other. Here's a quick look at our best in the past, present and future. Here goes - and if you aren't interested in our history, skip ahead to the Present and Future! 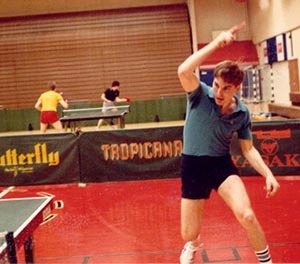 Alas, between the long hours working with Tim Boggan on his latest History of U.S. Table Tennis volume, and catching up on things last night, I wasn't able to put together a blog for this morning - and now I'm due to go back to work with Tim. So no blog this morning. Back tomorrow with a nice feature blog, tentatively about the past, present, and future of our national level players. I'll leave you with this quote, which I said to Tim after finally finishing a page after spending an hour on it fixing up problems and making numerous changes to it: "Our short national nightmare is over. Let's start the next one." And here's two minutes and nineteen seconds of cats playing table tennis. Yesterday Tim Boggan and I spent most of the day going back and putting in captions and photo credits for the 116 pages we'd done on Sunday and Monday. Between that and the many changes Tim had, we only got one additional chapter done. (This time we did the captions and credits as we did the pages.) So we've now done nine chapters and 132 pages. I haven't kept track of the graphics, but I'll get a count later on. What You Should Be Watching.